I have a couple of GOSH brushes which I love and picked up on a 3for2 last year in Superdrug, but I haven’t ventured any further into the GOSH range than that, until now. After discovering my love for bare coloured polishes (but not Nails Inc.) I picked up GOSH Nail Polish in shade ‘Ginger’ to try out. I also picked up ‘Tangerine’ but that’s for another day! 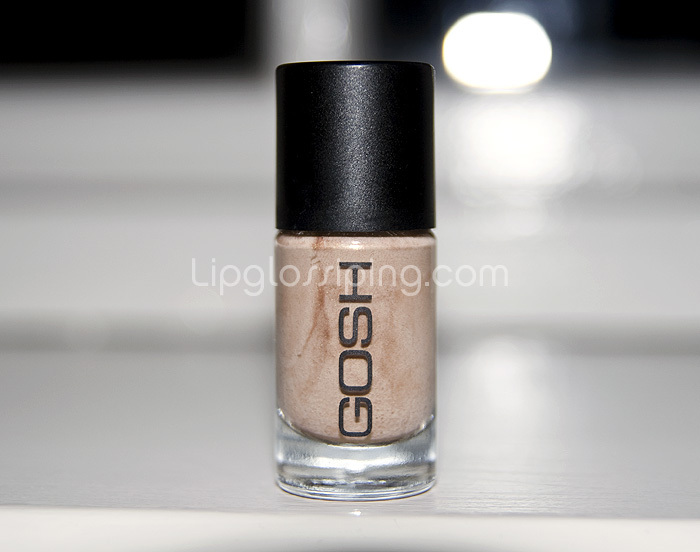 It’s a very pretty shade with a subtle but definite shimmer, it’s not particularly ‘ginger’ as far as I’m concerned. Application was a dream in comparison to Nails Inc., this is a solid 2 thin coater which builds up a lovely solid opacity. 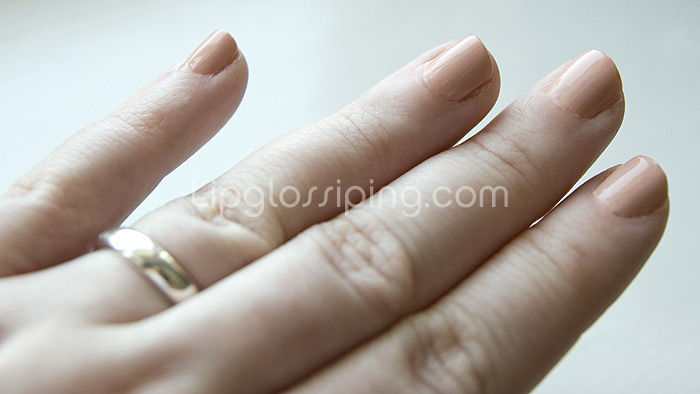 The consistency is smooth and runny enough to allow for quick drying between the two coats. I’m seriously impressed. It doesn’t have a hugely glossy finish despite the shimmer, but that’s nothing that a top coat doesn’t put right. I’ll definitely be heading back to the GOSH range for some more colours for the summer. Great stuff! GOSH Nail Polishes are priced at £4.89 each and available from Superdrug. I was looking for an automatic eyeliner, as I’m fed up of coming across blunt ones when I’m running late and need to have left the house 5 minutes ago! I should simply stick them all in the fridge every couple of weeks for half an hour and sharpen them in one go… but, well… I’ve got a life. I came across Maybelline Line Stylist a couple of weeks ago and grabbed one in ‘Black Sparkle’ which is described as black with a hint of glitter. 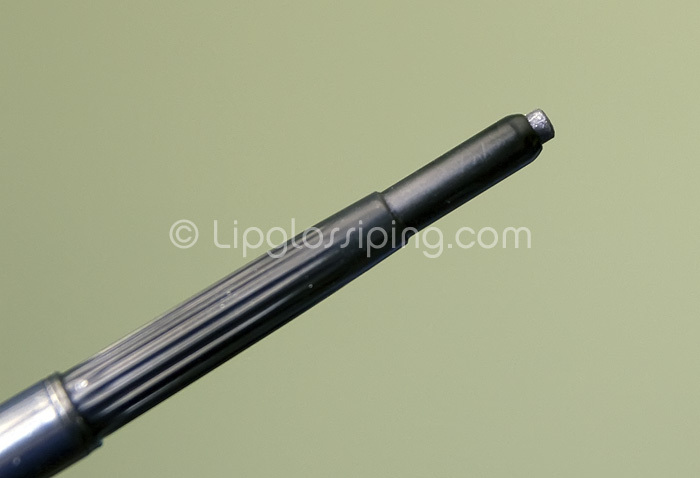 The pencil is nice and thin and the push up mechanism is smooth and effortless. Pigmentation is pretty good and a proper black as opposed to wussy grey… but jeez this thing drags. 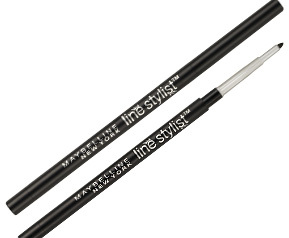 I only ever use pencil eyeliners on my lower waterline and this stuff is so hard and unforgiving that I find myself lining closer to my lashes rather than the waterline itself. Having said that, this stuff doesn’t go anywhere once it’s on. It simply won’t budge without my cleansing oil – which is fab for a waterline eyeliner. It’s just a shame I can’t apply it closer to the waterline without fear of causing serious and irreversible eye damage. I’m gonna try leaving it on the window sill in the hope that it might help to soften it a little in the sunshine. Oh, and I don’t notice any ‘sparkle’ in the black either. A lightweight, non-greasy serum designed for all hair types. Calms frazzled hair for a beautiful, natural-looking sheen and to tame those stubborn flyaways. I’ve used this twice so far, and I love how silky and light it makes my hair feel not to mention the glossy sheen it adds (must be all the silicones) and for those reasons I would buy it again. It’s also lightweight and has a rather delicious smell. However, it doesn’t seem to do much at all to smooth the little flyaway bits that stick up making my ‘do’ resemble an explosion in a mattress factory. Having said that, Tigi Bed Head After Party Smoothing Cream doesn’t do anything for me either and that’s 4x the price of this stuff and about 3x greasier. I’ve only tried it on wet hair, so I’ll give it another go after drying. Just wish I could find something that does what it says on the tin. It’s also leaves a greasy residue on your hands that needs washing off immediately which makes me a little wary to try it on dry hair. If you’re interested you can read more about it here and I paid £3 for a bottle in the supermarket. 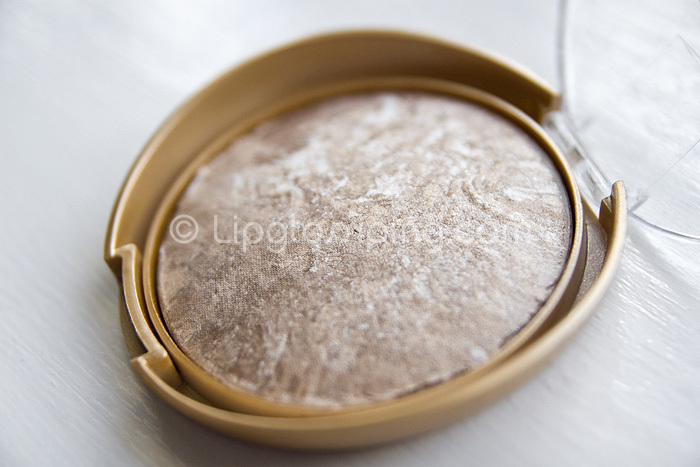 My bargainous baked bronzer turned up today, hoorah! Bronzer is something that scares me. Being so pale and uninteresting I screw it up on a regular basis. This one seems really light and shimmery though (shade 01), perhaps a little too light actually judging by the swipe I just made on my fingertip. First impression is that it seems as cheap as it was. The lid nearly splintered into 2 halves trying to open the damn thing to take a picture. Texture seems soft though, not gritty or particularly chalky. 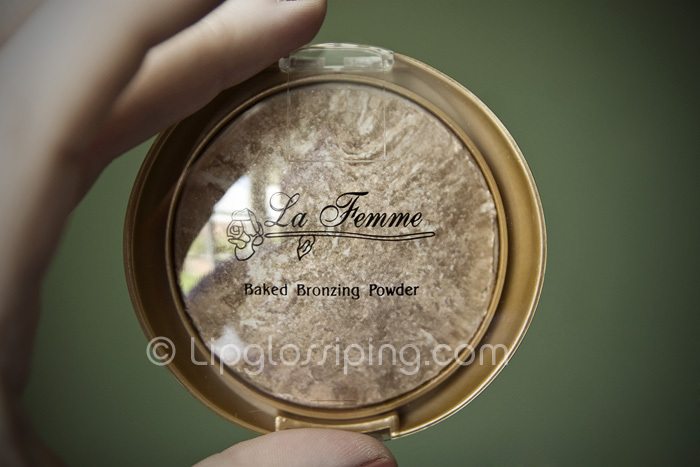 Oh, *psst* – by the way, that Baked Bronzer I got… the one by La Femme with all the pretty gold and white veining… load of pooh, really. I can’t get the product to show up on me. It doesn’t bronze, brighten or even highlight. I was hoping for subtle, but existent would have been nice. Perhaps a darker shade would be more evident, but my opinion of it is so… *meh*… that I can’t be arsed to order another. I’m really excited to be reviewing my first foundation today. Unfortunately this means a before and after shot, so if you have just eaten you may want to come back to this review when your stomach is a little more settled – just a friendly warning! 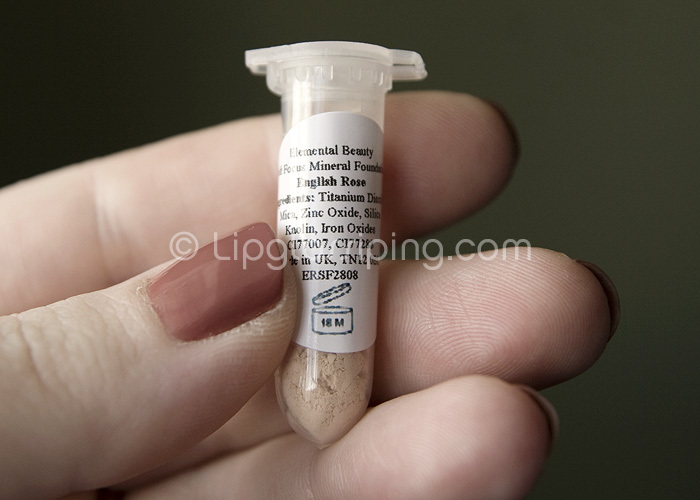 In defence of my closed mindedness, I do own a jar of Bare Escentuals Mineral Veil and that’s pretty much what happens to my skin everytime I use it, so you can perhaps understand my unwillingness to venture further into the mineral makeup market when my experiences with one of the ‘Big Names’ of mineral makeup had so far been disappointing. 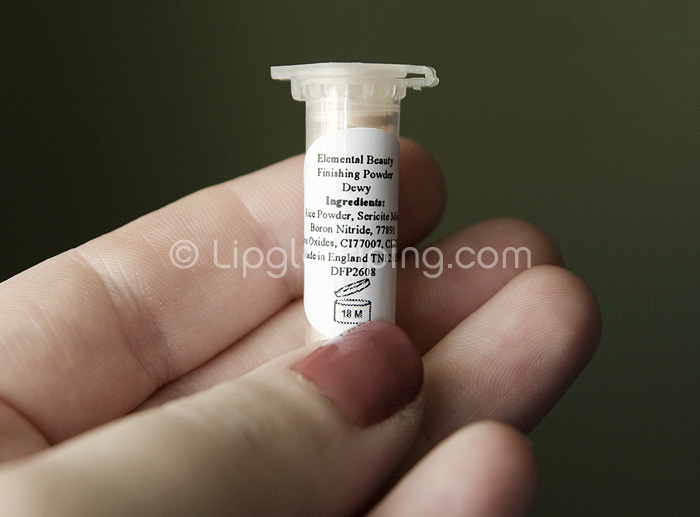 However, as the weather is turning warmer, my liquid foundations are leaving me too oily after a few hours wear and my oil-free liquid foundations are still giving me flakey dry patches of skin – so I needed to find a compromise and started googling for some Mineral makeup websites that would send me some samples to try without breaking the bank! How cute is that? I mean seriously… I was already impressed. 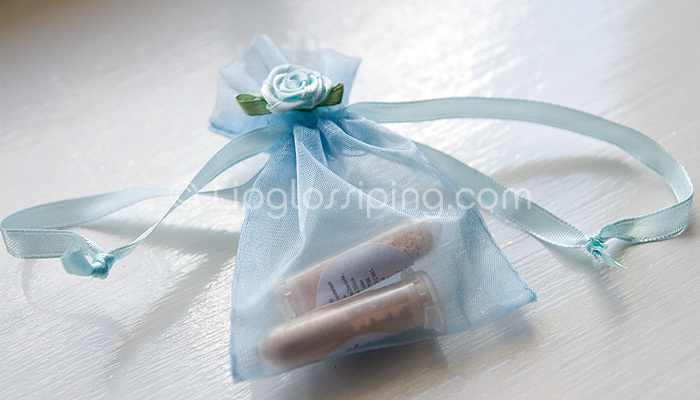 Judging by the images on their website – the full size jars are pretty darn gorgeous aswell! If you can’t read the ingredients, feel free to drop me a comment and I’ll happily type them up on here. Anyway, what do you think? I’m really impressed! It’s light but really evens out my skintone. 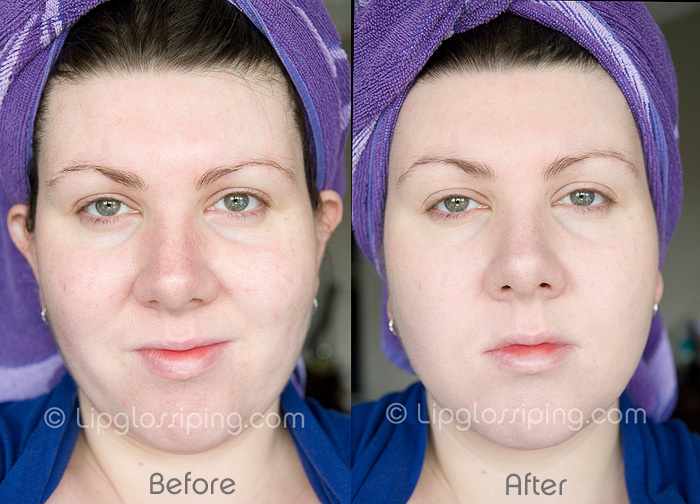 I could possibly have benefited from applying some concealer beforehand, but look at that strawberry nose and the cheek blotches – MUCH better in the after shot! I love this stuff. Truly. I’m not familliar enough with mineral makeup to know if I should have gone over the more blotchy areas more than once, so I didn’t… I literally took about 40 seconds to apply the foundation, probably paying far less attention than I should have done and I’m still delighted with the results. I’m gonna become a Mummy in about a week’s time so I shall make sure to get my order in for the foundation as this is just too easy for a foolproof application over the summer months. Still not convinced this won’t be too drying in the winter for my skin… although I shall approach with a more open mind this time and possibly armed with industrial strength moisturiser. 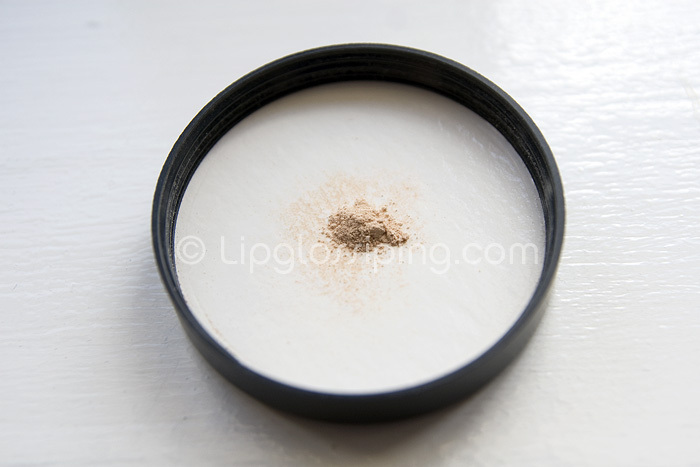 I haven’t tried the dewy finishing powder yet, not quite sure what to do with it yet. I shall read up and be back with an opinion some time soon! I was browsing the shelves of my local Boots looking for something to spend my latest ‘£2 off’ till spit on, when I spotted Bourjois’ So Laque! Nail Polish claiming to last up to 7 days thanks to the extra vinyl – woohoo! So Laque! is currently on offer in Boots down to £3.37 from £5.37, so now is a great time to try out some new shades and if you’re organised enough not to have dumped the ‘£2 off’ till spit from last month, you can pick one of these varnishes up for a super purse friendly £1.37! 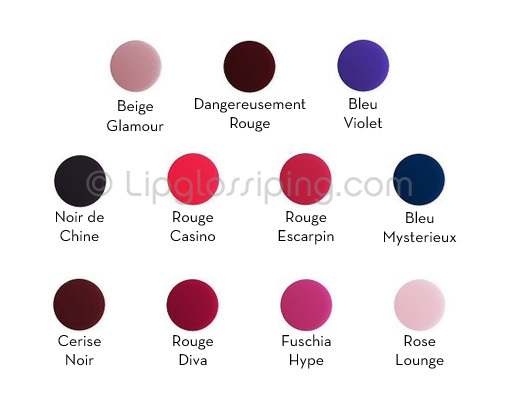 I’m really liking Bleu Mysterieux and Rouge Diva in particular for my pale pink-toned skin (although those weren’t available in my little Boots). 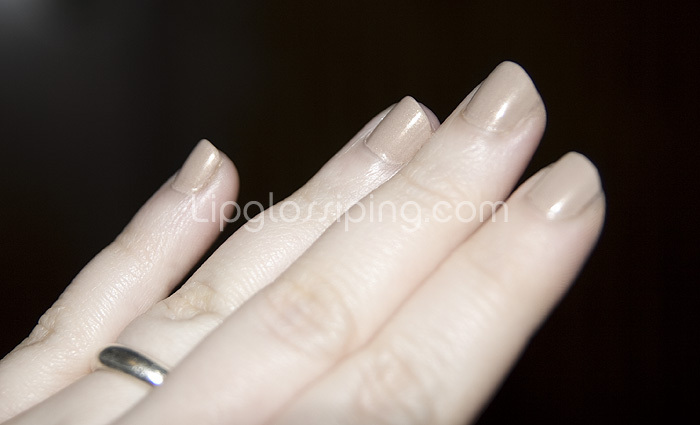 Consistency of Beige Glamour is very thick but smooth and not at all gloopy, there’s no sheerness about this polish and you could easily get enough coverage from a single coat to achieve a nice opaque finish. The downside is that it’s pretty unforgiving to any mistakes that you may make with applying. I actually preferred the colour I achieved from one coat as the 2nd turned the beige finish a deeper brown but my application skills demanded a second coat to achieve the glass-like finish I was after. Definitely not one to apply whilst making the morning commute by train! Drying time was perfectly acceptable and there’s not a hint of streakiness, super matt perfection! I’m not sure I’d pay the RRP of £5.37 for Bourjois So Laque!, not when there’s so many other great brands out there vying for my attention – this polish hasn’t wowed me, but if it lives up to it’s 7 day wear promise then I’ll definitely be picking up some more shades while they’re still available at £3.37 each. Review value rating is against the full RRP price. 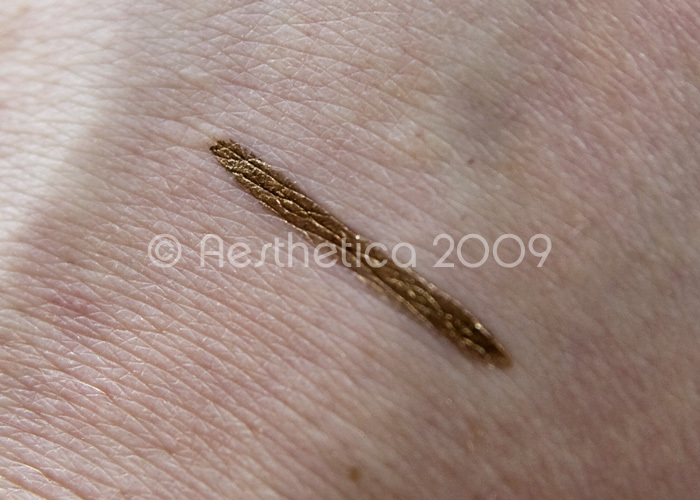 So this is the liner referenced in this post, my super bargain from Deal Extreme priced at $3.75 with free worldwide shipping. Texture is really creamy, slightly greasy – but this makes for a very smooth application. I don’t own any MAC or Bobbi Brown gel liners ‘cos I’m a complete pauper so I can’t compare to the high end brands – but I have a fair few gel liners I’ve picked up on the cheap including Sleek, Smashbox, Go Cosmetics and Elizabeth Arden. 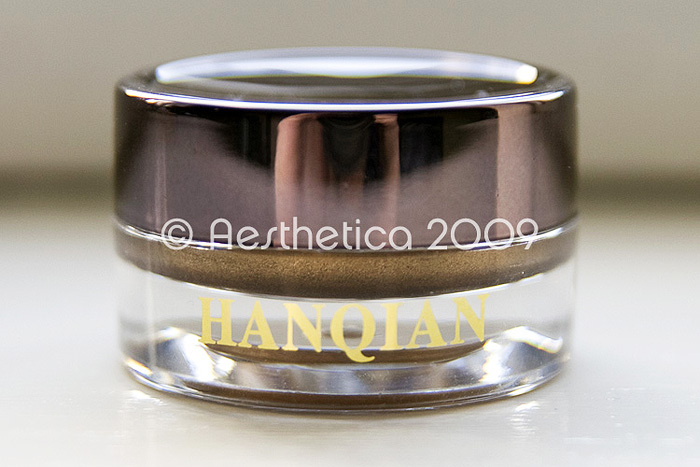 As I’ve said, the application is a dream, thanks in part to the slight greasiness that the liner imparts. 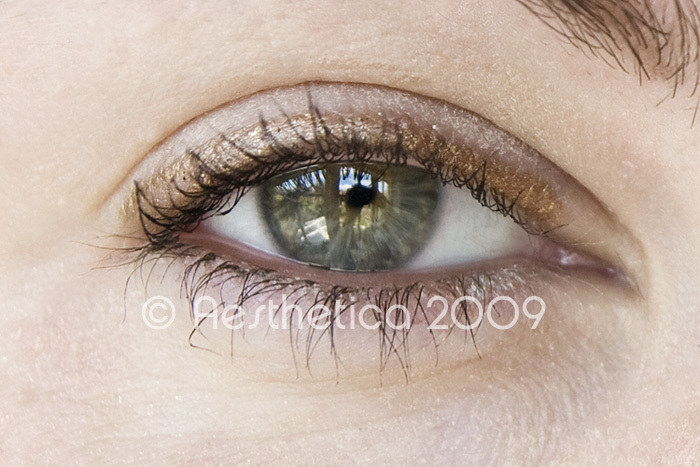 Pigmentation is really rather good, especially with a 2nd or 3rd sweep of the eyelid. Thanks to spidery lashes, I usually really struggle getting a nice line with liners that can sometimes be a little clumpy or thick (especially the cheap ones that I keep insisting on trying!). 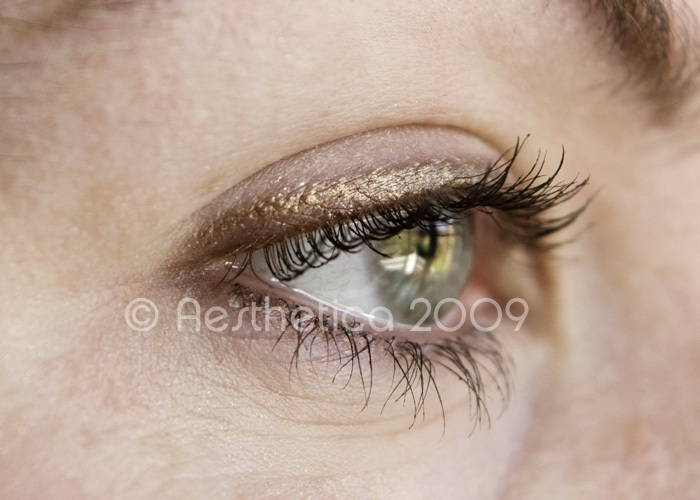 No such problems here as I was able to make single fluid sweeps across the eyelid without my lashes bunching up or getting in the way and transferring the product to the rest of my eyelid. This was after 3 sweeps with the liner. 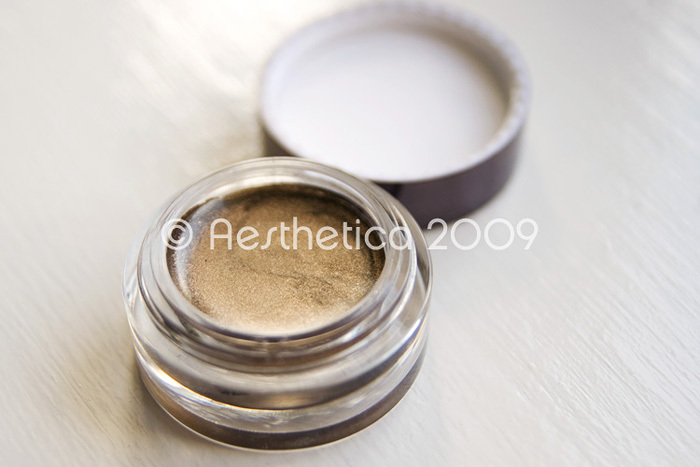 It’s a lovely shimmery colour with no chunks of glitter – I’d still say it was more gold than copper though. That’s where the praise ends I’m afraid… Thanks again (I’m sure) to the slightly greasy texture – it didn’t set solid and after a few blinks, I had a matching line just above my eyelid crease. Super disappointing but really rather predictable from a $3.75 liner. 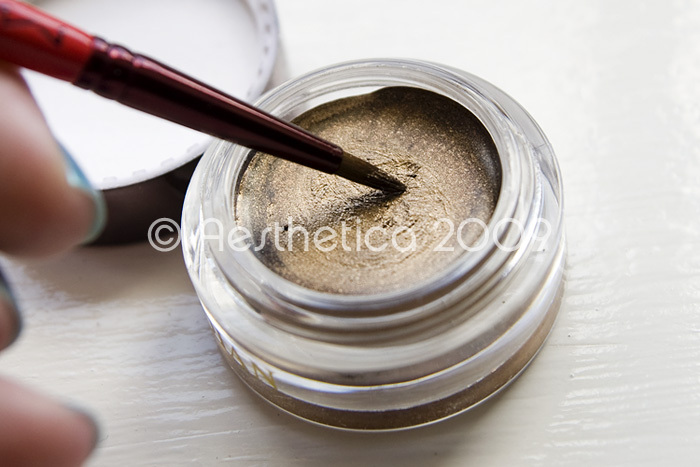 Not to be beaten, I grabbed a soft pencil brush and a neutral brown eyeshadow and gently traced the eyeliner almost patting it hoping that the powder may go some way to setting it. Amazingly, my ingenious little plan worked, and not only that – but it also improved the colour, making it more wearable for during the day. Hurrah! Still going strong with no smearing or transfer! I’m definitely stashing this, and going back for the other colour available on Deal Extreme: ‘Aquamarine’ which looks like a regular Jade-y green to me. I should also mention that I haven’t noticed any irritation from this product at all, but if you’re particularly sensitive, please be cautious! Always on the hunt for a bargain, I came across this eyeliner whilst making one of my regular orders of crap from Deal Extreme, I couldn’t really turn it down at $3.75 with free shipping could I? It may well blister my eyelids but it’s a chance I’ll take in the search of cheap but fabulous beauty products. Regardless of this product, if you haven’t checked out Deal Extreme yet, I urge you to. You can get all manner of utter crap at ridiculously good prices – the most fun you can have with your Paypal Account! Shipping is free and generally takes around 8 working days from ordering to reach the UK. Superdrug is a must visit for high-street huntresses, however, unless you have a particularly strong constitution I suggest avoiding visiting during school holidays or Saturday afternoons as you may struggle to get near the stands amid a wash of pre-teen girls and a fog of impulse body spray. N.Y.C is not a brand I’m familliar with (yet!) – a little like Barry M and 2true, I’m slightly intimidated by the colours and the plethora of plastics, shrinkwraps and security tags attached the products in a vain attempt to stop the afore-mentioned pre-teens from nicking the goodies. 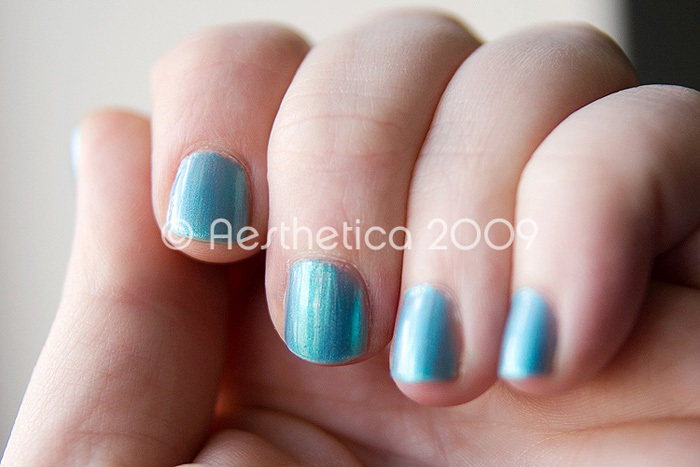 I was looking for some cheap polish for a mid afternoon pick-me-up and this colour caught my eye, it’s a shimmery metallic blue/green which totally reminds me of a bluebottle fly (you know, the pretty shimmery bit!). Anyway, application is easy with a surprisingly good brush which makes for a full nail application in a couple of simple strokes. It’s pretty sheer, and needed 3 coats to achieve the colour payoff as shown on my natty nails – something which I’d usually moan about, but application was so smooth that I didn’t struggle at all with 3 thin coats and didn’t grow any new grey hairs in the time it took to dry. Price was a very reasonable £2.93, but Superdrug are currently offering 2 N.Y.C Nail Glossies for £2.99 (bargain!) so if you want to try some new colours now is a good time to have a look! 3 days after application – lasting well with no chipping yet!